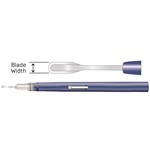 Disposable, single-use metal blades, ophthalmic angled slit knives with blue handles. Handle has smooth, single handed blade retraction and has ergonomic design. Blades have superior sharpness and are available in various widths and bevel designs with 45-degree angled tips. 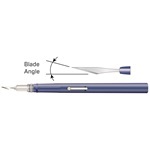 Disposable single-use metal blades, crescent knife, 2.2mm, bevel up, 45-degree angled tip. Blue handle with smooth, single handed blade retraction. Disposable, single-use metal blades, ophthalmic LRI knives with blue handles. Handle has smooth, single handed blade retraction and has ergonomic design. 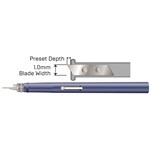 Blades have superior sharpness and are available in various preset incision depths with a 1.0mm blade width. 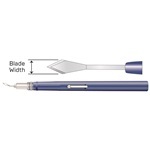 Disposable, single-use metal blades, ophthalmic Sideport and MVR knives with blue handles. Handle has smooth, single handed blade retraction and has ergonomic design. Blades have superior sharpness and are available in various sizes and are straight or angled. Disposable, single-use metal blades, ophthalmic straight knives with blue handles. 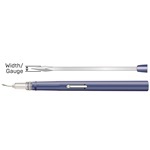 Handle has smooth, single handed blade retraction and has ergonomic design. Blades have superior sharpness and are available in various angles and are double bevel.